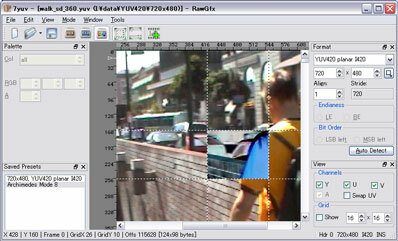 Version 1.6 of the Datahammer 7yuv Raw Image Editor has just been released. The biggest visible addition is a RawText mode, which allows to edit a binary file as ASCII or UNICODE text. Other than that text and hex string search has been added in the hex editor mode. The biggest actual change however is a complete overhaul of the code base - everything has been ported from native Win32 API to QT. This was done to compile Linux and MacOS versions in addition to Windows, so stay tuned for those ports. A lot of video codec and camera development is done on Linux these days, so I hope a good YUV viewer like 7yuv will come in handy here. You may notice that some of the dialogs look more modern now, this is due to the QT rewrite. any word on the linux port?